AYR Racecourse and Western House Hotel were awarded the Business Excellence Award in the manufacturing and service category at the annual Ayrshire Chamber of Commerce Dinner held in the Princess Royal Suite at the racecourse last Friday. 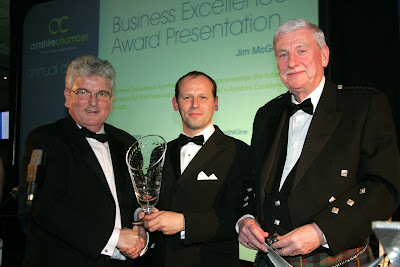 The award, presented by Business Excellence Ayrshire managing director Jim McGeehan to Ayr Racecourse general manager William Gorol, caps an amazing turnaround in the fortunes of the business. 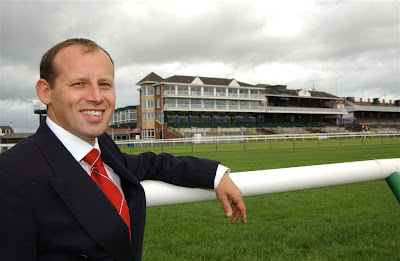 In June 2003 Ayr Racecourse was bought by Alan Macdonald, owner of the Dawn Group, and Richard Johnstone, managing director of healthcare provider Thorntoun, in a £10 million deal. The course and its buildings were in need of a major investment in order to re-establish Ayr as Scotland’s premier racecourse. Since then there have been massive improvements to the course and its facilities, with many more in the pipeline. One of the most significant changes was the £4.5 million transformation of Western House from the HQ of the Western Meeting Club to a four-star hotel. 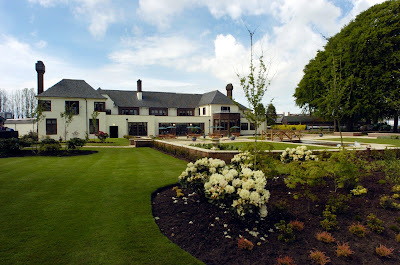 In under three years the Western House Hotel (pictured above) has established itself as one of Scotland’s quality wedding venues, and won a string of awards including the Scottish Wedding Hotel of the Year in both 2007 and 2008 and the coveted VisitScotland Thistle Award for Customer Care – Serviced Accommodation 2007. Other improvements include the opening of the Princess Royal Exhibition, Banqueting and Conference centre in 2005 - Ayrshire’s first ever dedicated venue of its kind. And next month the £4.5 million Ayrshire Suite will open on the ground floor of the Princess Royal Stand. This will provide a 2500 capacity Grandstand sports bar on racedays and state of the art conference and banqueting facilities on non-race days. Among the first events to be held there will be the 2008 Scottish Conservative Party conference in May. Over the past year the racecourse has also staged its first ever rock concert – Rock At The Racecourse featuring The Saw Doctors and Deacon Blue, and in May this year Burns Rock At The Racecourse takes place with Status Quo and special guests From The Jam. The legendary Saints and Sinners race night will also be staged at Ayr for the first time ever in June after organisers decided to move from Hamilton in order to raise even more money for the charities it supports. The Racecourse itself has scooped the Racegoers Club Racecourse of the Year Award for Scotland and the North East for four successive years from 2004-2007. Now more than 80 full-time staff are employed at the Racecourse and Western House, with the number reaching around 700 on major racedays. Ayr Racecourse general manager William Gorol said: “It is a great privilege to receive this award on behalf of the team. Alan Macdonald and Richard Johnstone had a vision for the racecourse, and they are already well on their way to achieving that.